First I have another finish. This one is only 53 x 67.5" so it quilted up pretty fast and I did the binding by machine again. This is what I worked on yesterday while contemplating the finish for the black and white pinwheel quilt. No decisions made yet. I had enough of this yellow print to use for a backing, and did the binding in the same fabric as the inner border. I want to thank all of the commenters yesterday. I heard from lots of new people, some whom I can't reach with an email, so thank you for breaking your silence and commenting. I want to explain the difference between the two quilts the way I would explain it to a group of people choosing fabrics for a quilt. The second quilt uses blend as its key. The closer the blend the more soothing it is to the eye. Earlier in my quilting career I would notice that when couples walked up to the quilts on display that the woman was interested and the man looked bored. The first time I had colorwash/watercolor type quilts on display the men were drawn in and asked lots of questions and the wives tried to pull them away. This circular pattern quilt is a colorwash technique which relies totally on value. You need many, many steps of value to get an even blend where in contrast you usually only need the light, medium and dark values. Black and white is especially hard to do really smooth. Now and then I will run into someone who says they don't like colorwash quilts, but I find the majority of people are really drawn to them. Not everyone has an easy time choosing the fabrics for a smooth blend of values. That was one of my favorite jobs at the quilt shop, helping them with it. The Strips and Curves pattern relies on a smooth blend to really work well. The more fabrics you have in the run, the smoother the blend will be. If you want to see the rest of the Strips and Curves quilts I have made, go to the right side of my blog and find them under LABELS. Again your tutitorials are so good. I can see from just looking at the black and whites, how difficult for me to achieve the values that you did. Both are Wandaful! Thank you for sharing your expertise, most of us would have to take classe$ for what you share with all of us. Just love the red and gold, to me it looks like Gold Leaf. Another gorgeous gem. Hi Wanda, just went to look at your other Strips and Curves quilts. They are all Wandaful! I especially like the one with the blues, orangey rust colors. The balance of colors in the various shapes is really amazing. 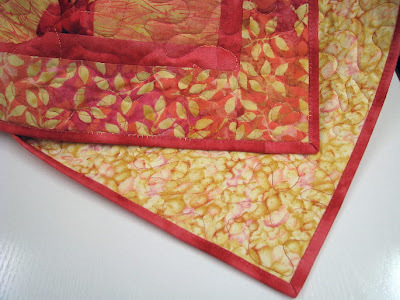 Wanda, I love the happy marriage of the backing, binding and top on the red/pink quilt -- it's quite yummy to my eye! 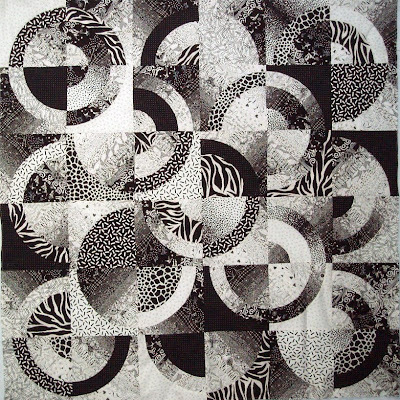 Black and white curves quilt. You did a MASTERFUL job of doing the colorwash on this quilt. I didn't even realize there were pieced areas until you talked about it. In my opinion it would be a big mistake to add any color to this quilt and take away from what you have accomplished. Thisis a magificent quilt. This statement is coming from someone who LOVES color. With this quilt you have accomplished something outstanding without relying on color. To me, that is the hardest thing to do. Have you ever thought about offering an online class? I'd be there in a heartbeat! I went to look through your Strips and Curves quilts - your b&w posted in late 2007 was one I commented on (with my old profile pic even) - love that top just as much today and understand so more about the array of skills you share with us every day! I don't think it is boring! Because you have built in irregularities in the border. And you still have a good chance to make it even a little more irregular. I believe that the ideal is somewhere on the road between very regular and chaotic. 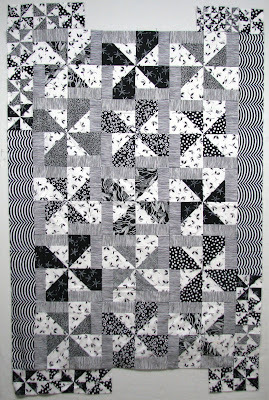 Yes, that curvy gradient b&w quilt is really amazing! I thought you were doing something with hand died fabrics but now that you pointed out how you managed the shading it just makes it more impressive! Wowza! I wish I could take you shopping with me. Value is one of my weak points. I have to pick 11 pieces for a Bargello from dark to light in two colors for a class, and I'm finding that the most difficult part. Part of it is the colors are not my favorites, and I want to go dark to light in 3 steps or less. I think I will go study that B&W piece a little harder, maybe it will inspire me. I really love reading your blog. Teaching, Inspiration, and class participation. If you did write up an online class, you would be overwhelmed with eager students. Bravo! A great explanation and your quilt does exactly that. I do think that you are right on the mark when you indicate that you need many step of value to achieve an even blend. You have done that to perfection in your Strips and Curves quilt. I did go shopping today to add to some of the batiks that I already had for my Strips and Curves class. I think I ended up with 28 different fabrics ranging from dark to light. I have a LOT to learn about value. My favorite color is yellow and I really love your red and yellow one. Exuberant Color is very fitting. Great post. I did a post on contrast, value and hue last week. I enjoy the quilting proces much more now that I pay attention to contrast. Thank you for the explanation; I now understand them better. I had not noticed the nuances of the one with curved pieces. I see the gradations now that my eye just took in without being consious of it. I wanted to comment on the colored quilt. 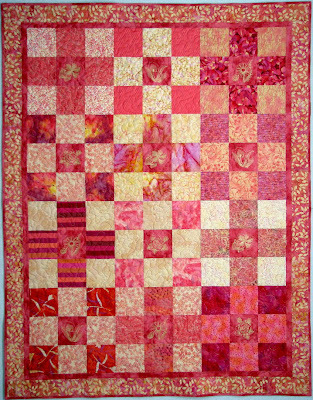 If the colors on the internet are true to the quilt, then it's a salmon/pink with some yellow--one of my favorite color combinations. I just love the quilt for the colors alone! I love your Strips and Curves, it is just beautiful. Is this your pattern? Thank you for the great tutorial. I know very little about color value (would probably flunk an art school test about it), but do the best when I can just start playing with fabrics and putting them together. Sure wish I lived closer and could take a "real" class from you. I learn best when I hear a lecture and see a real live demo. Wanda, you mentioned "I did the binding by machine again" Do you mean totally by machine? I am dreading all the time handsewing the back of the binding will take. (and this quilt will be too big to carry with me) So if you have a magic way to do both by machine, please share that with me. Thanks for your 'mini leson' on value... it's so easy to get caught up on the color and not pay attention to value! I do see why some folks aren't fans of colorwash quilts... they're looking at the subject matter (which they may find boring) and not the effect of the fabric squares. I loved your Blurred vision piece... now that piece would make anyone a big fan of colorwash quilts! Thanks for sharing! That second quilt is fantastic! Another tip to help people learn value is to take a photo of your quilt, or just your fabrics with a digital camera. Either on the camera itself or on your software for the camera convert the image to black and white. it really helps you see value over colour. thanks for sharing about these black and white quilts...i've found them difficult (lots in my scrap box) and now i think i know a little more about why i struggle. i do like black and white without another color. this one is an amazing piece of work. I love your black and white strips and curves quilt. The top left small circles are especially nice. Very 3d looking. I'm a long time reader but once in a blue moon commenter. Thanks for doing what you do.